WOW! This is just beautiful! Those strawberries look so tasty! Wonderful card and color combo....that red bow tops it off! Those strawberries look good enough to eat! Yum! Tasty card!! Those strawberries make my mouth water! 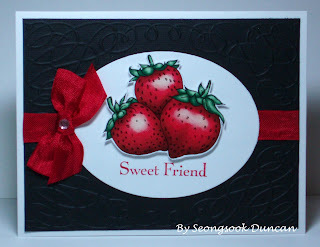 Love that embossing folder too - it's one of my favorites - the ribbon is a great touch. Thanks for playing in our Midweek Throwdown Challenge at Operation Write Home Stars & Stamps! Beautiful! And way yum!! My husband thanks you; I just told him we're adding strawberries to our kitchen garden. Hmm. Wonder where I got that idea? lol. Simply stunning. Your coloring is wonderful! Your berries look so yummy! Beautiful card. Gorgeous! Thanks for playing in our Midweek Throwdown challenge at Operation Write Home Stars & Stamps! What a lovely card! It's jus so pretty!